Every Muslim grows up knowing the significance and importance of Makkah and Madinah. From a very young age, we feel a familiarity and closeness to those two Holy Places. Yet the sanctity of Masjid al-Aqsa doesn’t always get a significant mention. 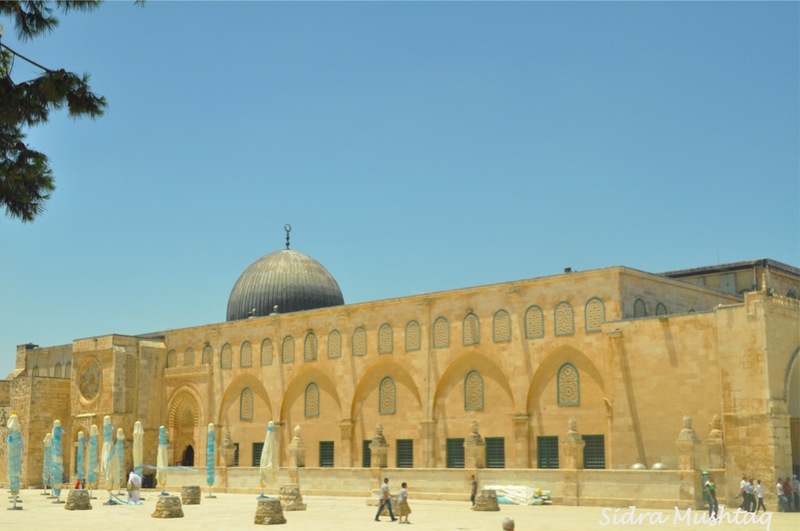 The name Masjid al-Aqsa (Bayt al-Muqaddas) translates as the “Farthest Mosque”. It’s the second house of Allah built on earth, and the first qibla for the Muslims. This is where our Prophet Muhammad ﷺ came on the miraculous night journey from Makkah riding on the Buraq, the winged horse. My parents had briefly told me about Masjid al-Aqsa when I was younger. 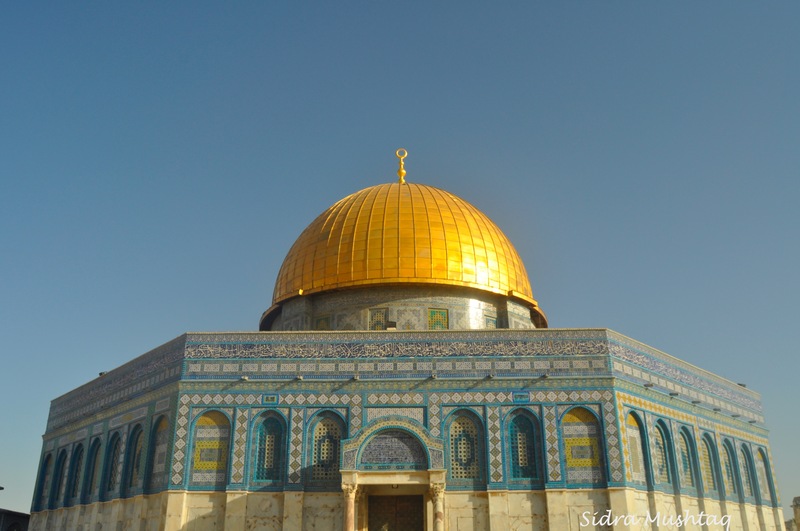 Yet it was only in later years when I developed an interest in Islam and began learning more about the Prophet Muhammad ﷺ that Al-Aqsa and the Holy Land began to feature more prominently in my mind. After visiting the two Haramain, Makkah and Madinah, I longed to visit the third: Masjid al-Aqsa. 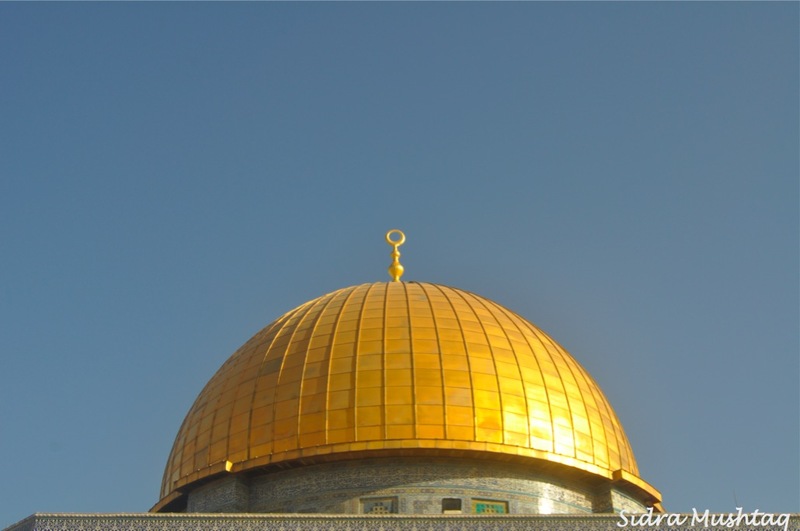 There was something mysterious about Jerusalem (Al-Quds) that always filled me with a deep sense of awe. I was yet to visit, but I felt sure it was a special place and I needed to go and experience it for myself. I had been under the impression that it’s extremely difficult to get into Jerusalem as Muslims, and that it wasn’t safe. My family was also under the same impression so nobody tried or even looked into going. It was only when one of my best friends Asma went travelling around the Levant at the end of 2009, that I started believing that I too could visit Jerusalem. I kept my wish within my heart and knew that one day, it would happen, if Allah wills. A few years later, my friend Sheba and I planned to visit Jerusalem. We sought all the travel advice we needed from our friend Asma. We had almost booked our flights, but due to unforeseen circumstances, we were unable to go. Although it was disappointing, I still held onto the hope that Allah would give us another and better opportunity to go, where everything would be facilitated for us by Him. We just had to hold on tight to that thought and stick to our intentions. 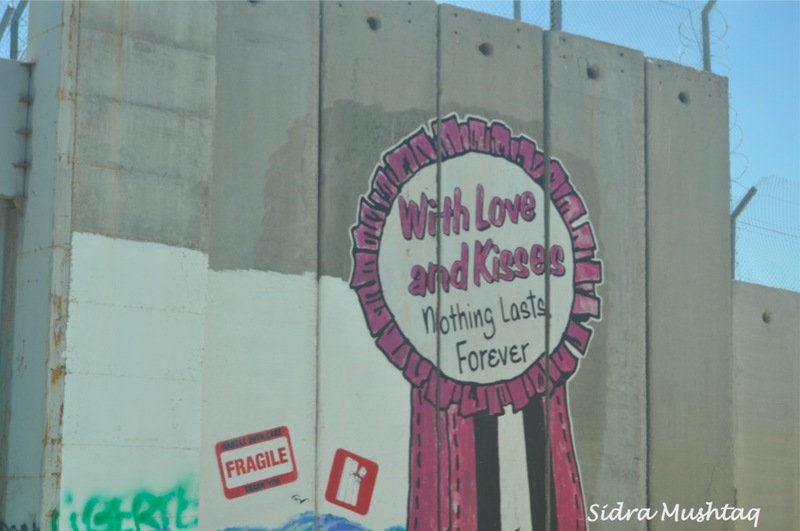 Three months later, I got an email from Sheba about a trip to Jordan and Jerusalem. She was planning to go with her mother and sister and asked me if I wanted to join them. My cousin Anam had also been looking into trips to Palestine, so when I mentioned this to her, her immediate reaction was “lets do it!”. Of course, I didn’t require much encouragement; I had been ready to go for years. We booked our trip with Islamic Travels Islamic Travels and everything went smoothly, thanks to their level of service and professionalism. I’ve never known a Muslim organisation that responds to queries and deals with bookings so swiftly! So finally, we were going to visit the Land of the Prophets! I felt the need to prepare a bit, so as a reminder, I started reading the famous “Stories of the Prophets” by Ibn Kathir. My anticipation grew each day, but I tried restraining my excitement, as there was always the possibility we might not get entry into Jerusalem. I wanted to let go of all expectations and maintain a positive attitude, so kept telling myself “If it’s meant to be, it will be”. The day arrived when we were leaving for our trip. At London Gatwick, we met the rest of the group for the first time; there were 50 of us in total. There was quite a mixture of people, some who were familiar to me from Islamic circles in London, some who were not. I was content being there with Sheba and Anam, two people whom I love dearly and knew would be great travelling companions. At last, the day arrived when we were leaving Jordan to enter Jerusalem. We got to the Jordanian border at 9am and had to queue for a visa. The Israeli authorities at the border gave visas to all the seniors who were aged 50 plus in our group without any questioning. The rest of us were held back and we just had to sit there and wait. I was mentally prepared for this situation and knew we would be hanging around for a very long time. The only thing I wished I had done was taken a good book to read. We weren’t the only group that were held back, there were lots of other groups and individuals who also had to undergo the “interrogation process”. The Israeli officials selected randomly, calling one person at a time for questioning. It was a very slow process. As a group, we stuck together, sitting on benches and on the floor. This was the point where we all actually started getting to know each other, bonding as a result. It reminded me of Hajj, where at the beginning you hardly know anyone, but then after spending hours at the camp in Jeddah and the road trips, you become one family. Everyone in the group was patient. Nobody complained or provoked the officials. 12 hours had gone by and they had questioned almost everyone in my group apart from me and four others. 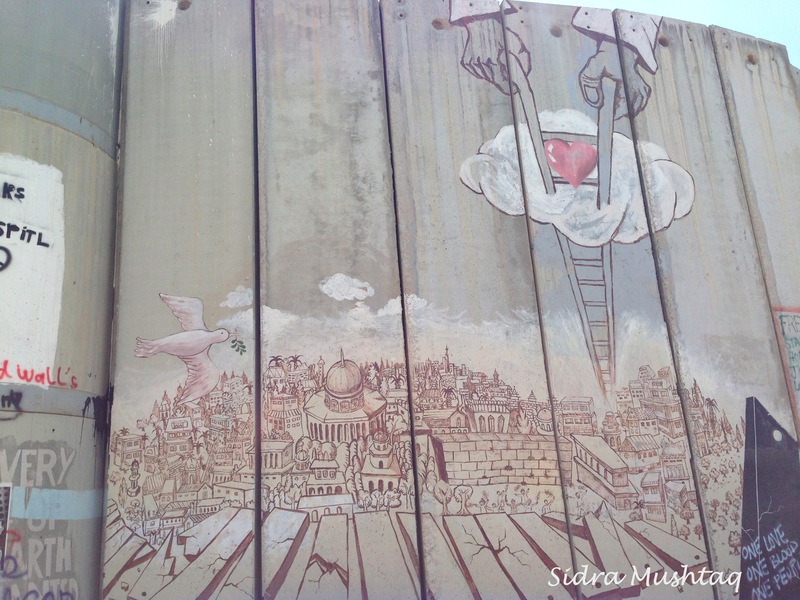 As long as we got into the Holy Land, I didn’t care how many hours they detained us. Yet it was only human to have that natural feeling of fear, that natural question which was at the back of my mind, “what if I get turned away?”. It was only at that point that I started feeling a little bit anxious as I thought only those questioned would get visas. It was getting quite late, and the closing time of the border was near. Everyone was hungry and tired by this stage, but the thought of praying at Masjid al-Aqsa gave us energy and kept us all going. Finally, an officer came out and started handing back some of the passports with visas. They staggered the process of returning everyone’s passport, but again, everyone waited for each person to get theirs back. I was lucky to be one of the few people who got a visa without questioning, not that I would’ve cared if I’d had to undergo it. It all worked out well, Alhumdulilah! The coach journey to our hotel in Jerusalem went smoothly, we did not get stopped at any checkpoints. 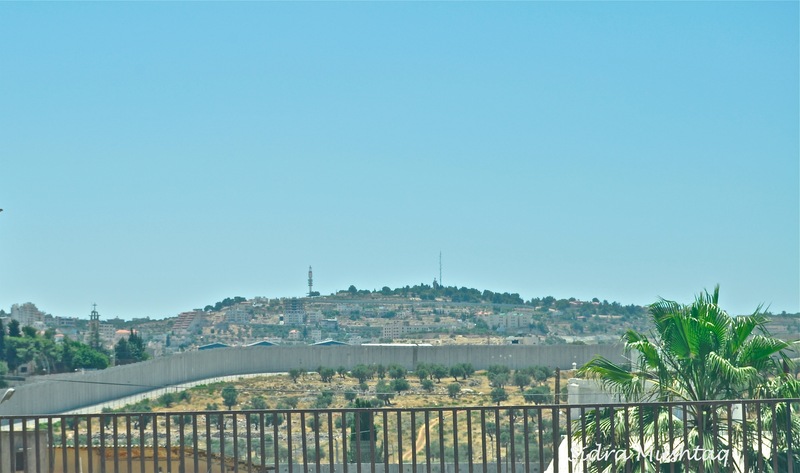 Our hotel was located on the top of Mount of Olives, which provided us with a panoramic view of Jerusalem. 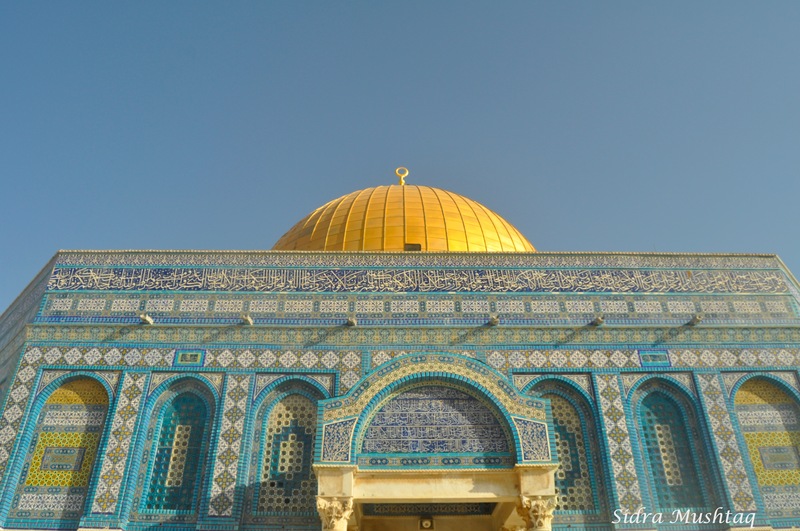 As we reached our hotel and got off the coach, our eyes witnessed the splendid Dome of the Rock Masjid (Masjid Qubbat As-Sakhrah) for the first time. 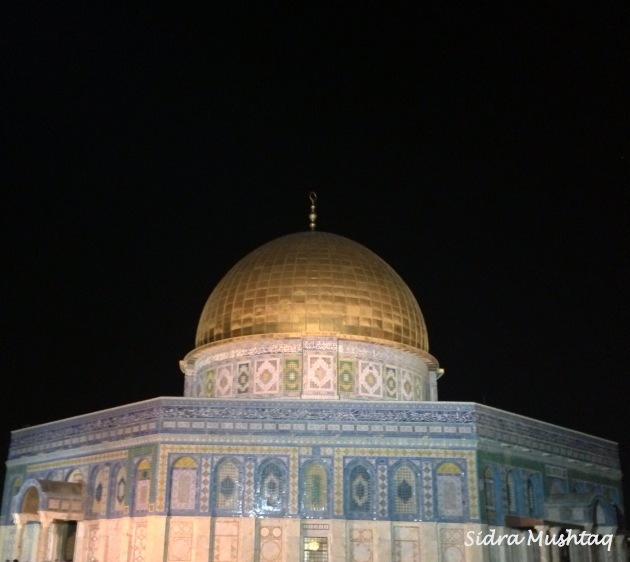 It felt surreal; we actually made it to al-Quds! I was rather overwhelmed, so the first thing I did before even checking into my room was call my mother back in the UK. I wanted to share the moment of being in a blessed place with her. 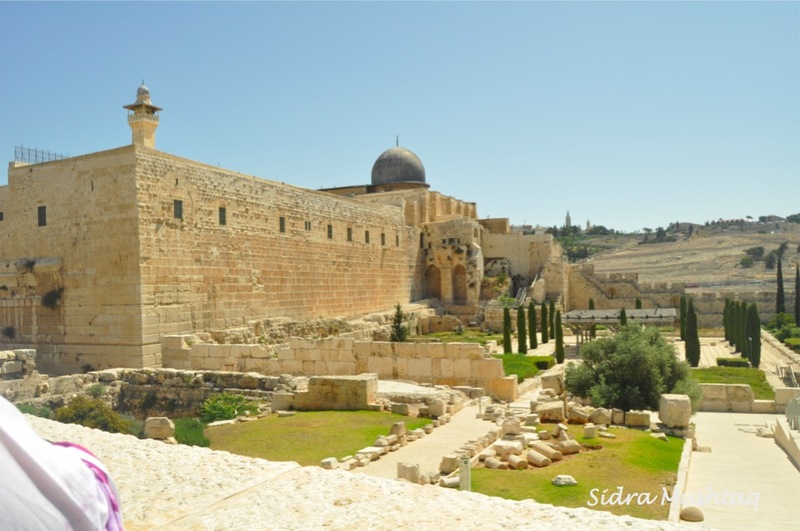 My mother was thrilled that we had made it to Jerusalem safely, especially since it was the blessed night of the Isra wal Miraj the following night. It was almost midnight and the fajr prayer was at 4am. 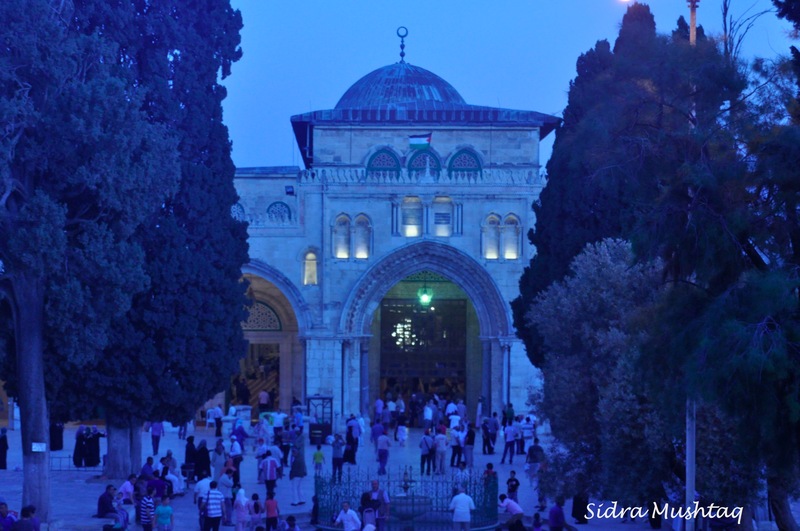 You could feel everyone’s eagerness to pray fajr in congregation at Masjid al-Aqsa. We knew we had to leave the hotel around 3:30am to make it on time. I tried sleeping, but my mind was too restless. The excitement was just a bit too much! We only had three days scheduled for Jerusalem, out of which the first had already been spent at the border. This meant we only had two days to fit a lot in, so sleep was not going to be part of the agenda. The coach dropped us off at a coach stop and it was a good 10 minute walk up a steep hill to Masjid al-Aqsa. We had a lovely elderly couple in our group, aunty and uncle we called them (we are desis after all!). They had come on this trip with some members of their family. Uncle has been afflicted with Parkinson’s, which meant he had days where he could not move at all. Since our flight from London, and throughout our time in Jordan, uncle had been motionless and his wife and sons were helping him in the wheelchair. However that morning, as we were all walking up to Masjid al-Aqsa, uncle was there in front of us, racing to get to the fajr prayer! It was like a miracle, he wasn’t even using his walking stick! As we were walking towards Masjid al-Aqsa, there were guards stopping and searching whomever they could. I had mixed emotions. Part of me was elated and overwhelmed, I simply couldn’t believe where my steps were taking me. 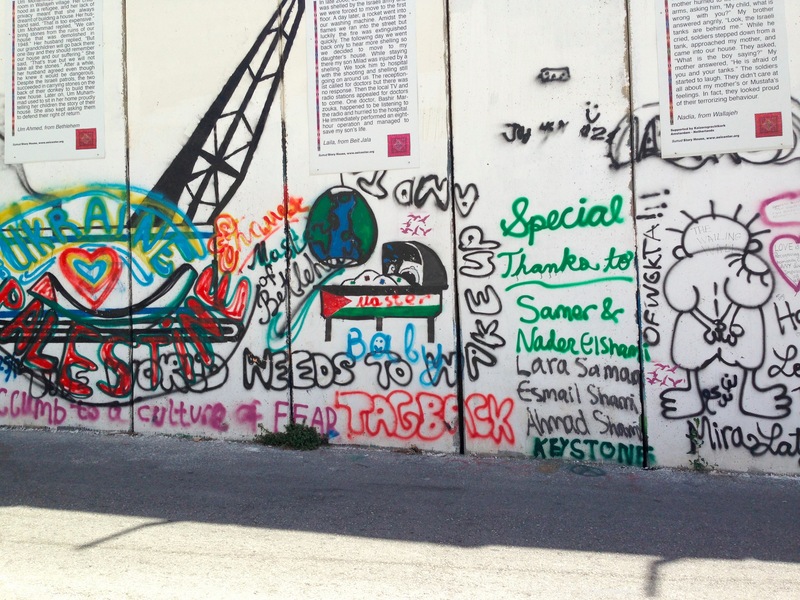 The other part of me felt immense sadness because of what our Palestinian brothers and sisters have to go through. Many of them can’t even pray at Masjid al-Aqsa. Being stopped and interrogated unnecessarily will outrage any normal person, but imagine how the Palestinians feel when this is an almost everyday reality for them? We prayed the first fajr prayer in congregation. The recitation was absolutely beautiful. I still couldn’t believe I was sitting in Masjid al-Aqsa. After the prayer, people gathered for Qur’an and study circles within the mosque. Escaping the oppression that lay beyond those walls, people still managed to find time for their Lord. It was a moment to behold. Masjid al-Aqsa at fajir time (morning prayer). We had a packed schedule for the day so we had to leave the Masjid straight after fajr prayer. 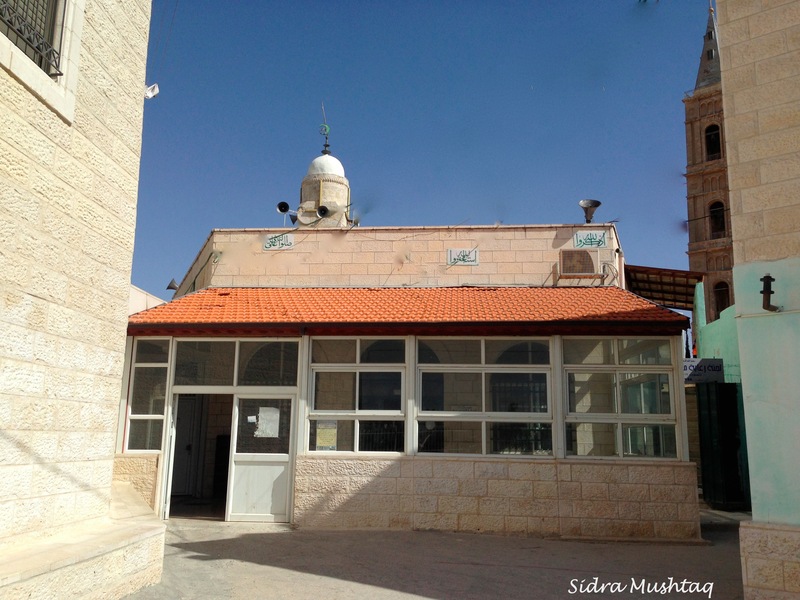 Our first stop was going to be Masjid-e-Khalil in Hebron. Below is a snapshot of some of the places we visited during the day. 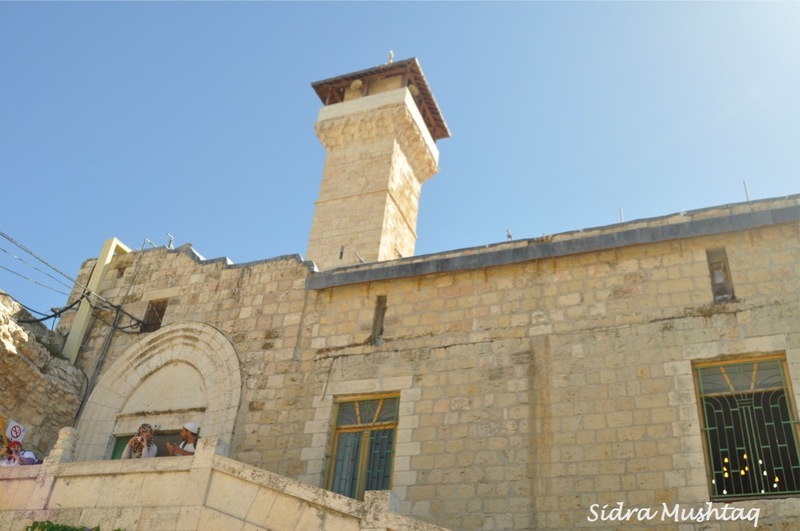 Masjid-e-Khalil, also known as the Cave of the Patriarchs, is built on Mount Nabi Yunus, the highest peak in the West Bank. 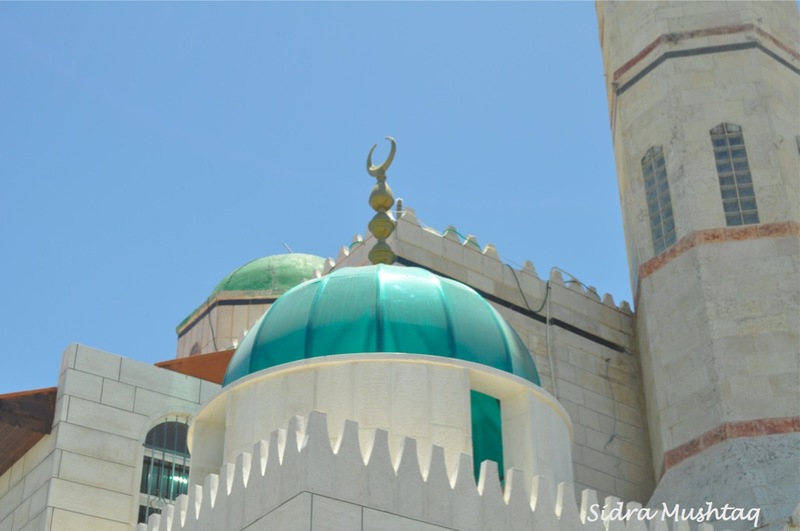 The Masjid is built over a small cemetery and the following Prophets and their wives are buried there: Prophet Ibrahim and his wife Sarah; their son Prophet Isaaq and his wife Rifaqah; their son Prophet Yaqoob and his wife Liah, and their son Prophet Yusuf. Peace be upon them all. 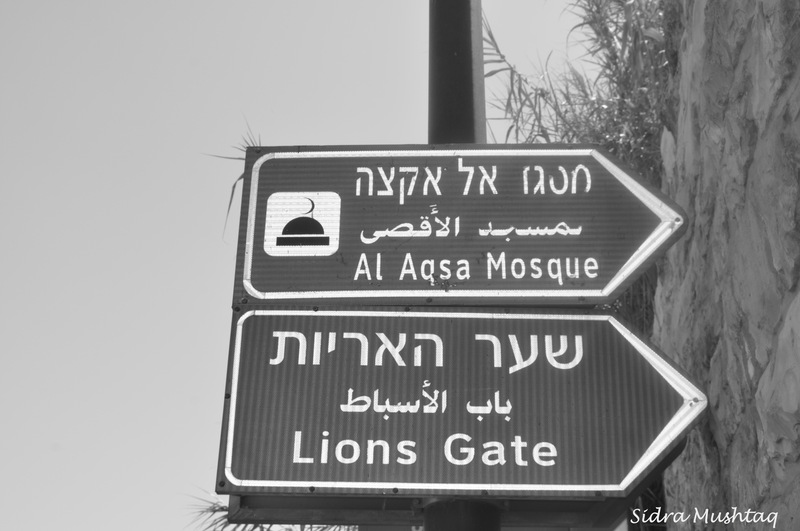 The place is split into two; on the right you have the Masjid for the Muslims, and then on the left is a synagogue for the Jews. The entrance is guarded and controlled by Israeli soldiers. 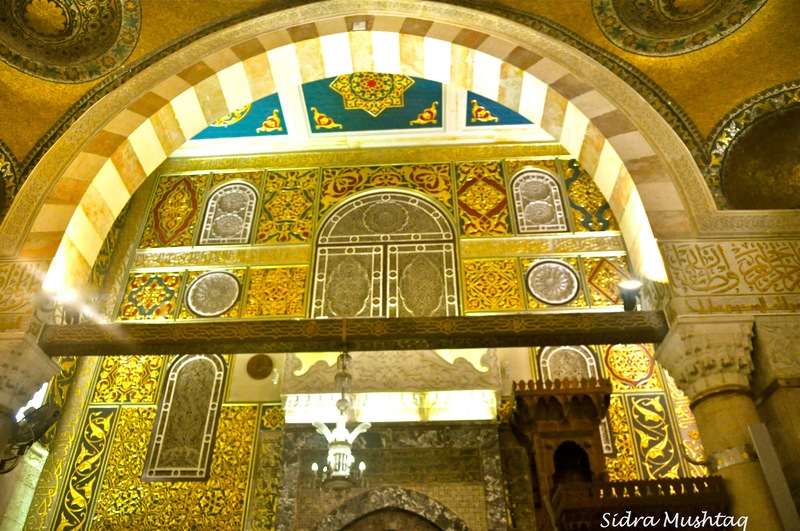 Within the Muslim side are the tombs of Prophet Ishaq, his wife Rifaqah and his mother Sarah (peace be upon them all). 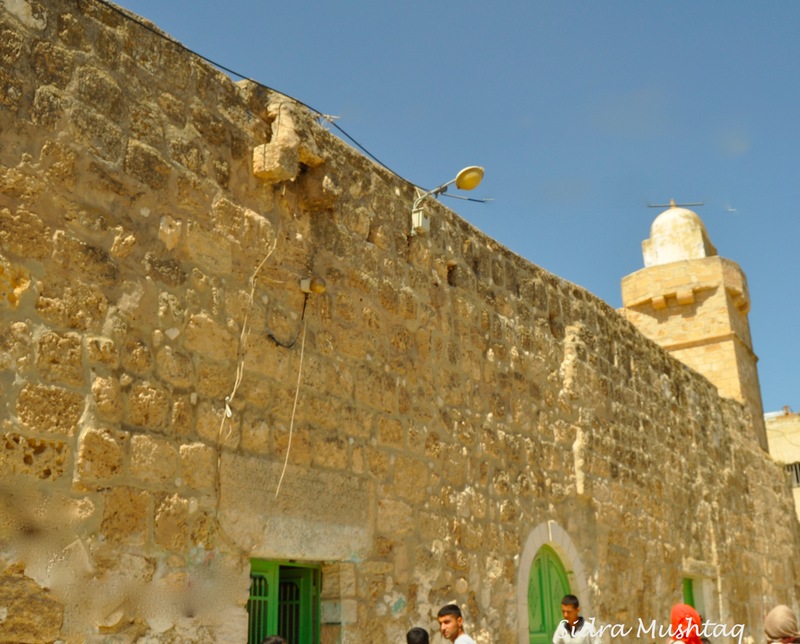 Within the Jewish side are the tombs of Prophet Yaqoob, his wife Liah and Prophet Yusuf (upon them all be peace). 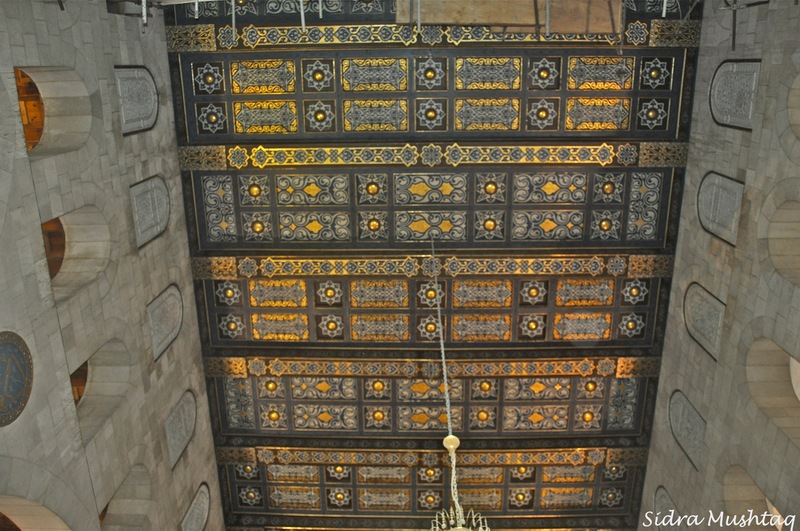 Prophet Ibrahim’s (peace be upon him) tomb is in the middle and accessible from both Jewish and Muslim sides. The tombs are directly over the graves, which are below ground. 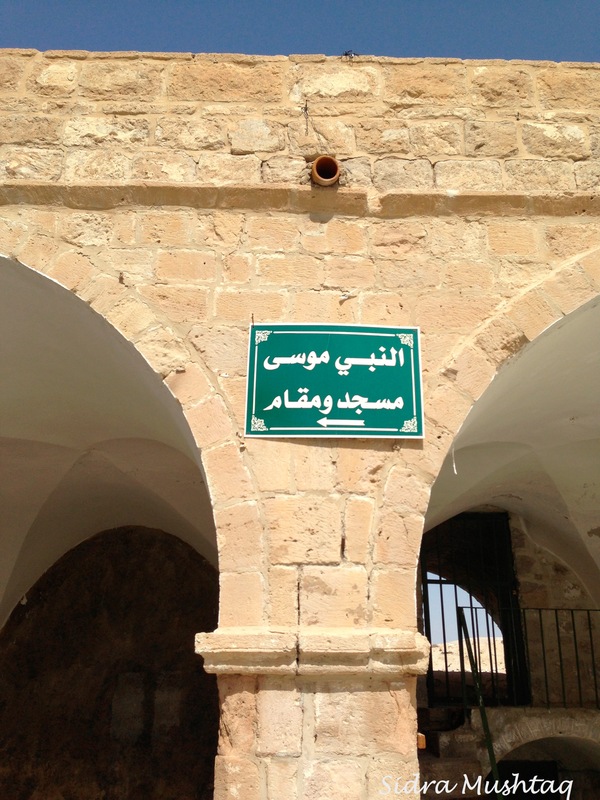 The Maqam is situated in the town of Bani Na’im. Prophet Yunus (peace be upon him) Masjid, with his tomb inside. Inside the Masjid is the grave of one of the most famous of the Companions of the Prophet ﷺ: Salman al-Farsi (may Allah be pleased with him). 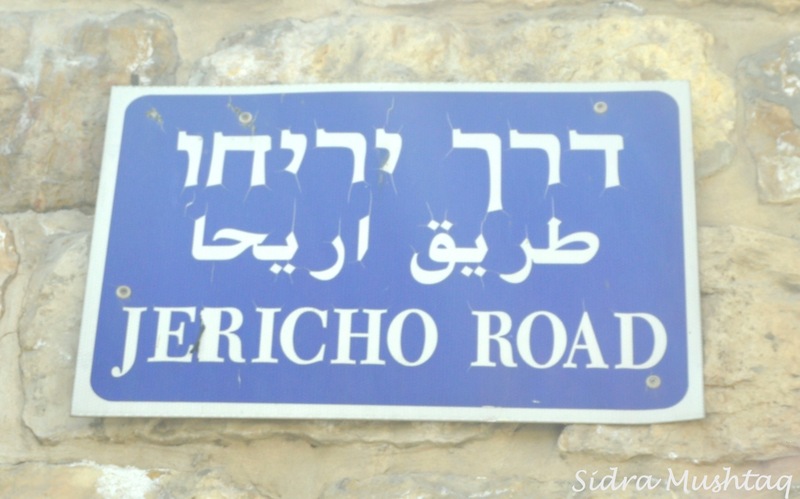 It marks a place where he once stayed and is located on the Mount of Olives in Jerusalem. By the time we had finished visiting all these places, it was nearly time for the Magrib prayer. It had been an intense, but amazing day. We had visited the Maqams of some of the Prophets who had stepped on this Earth; it was a truly special experience and it only increased the desire of wanting to actually meet them in the next world, in al-Jaanah (May we all reach al-Jaanah without any reckoning and be with all the Prophets. Ameen!). We prayed the Magrib prayer in congregation inside the Dome of the Rock Masjid, and then went back to our hotel to freshen up for what was going to be a very blessed night: Isra wal Miraj. 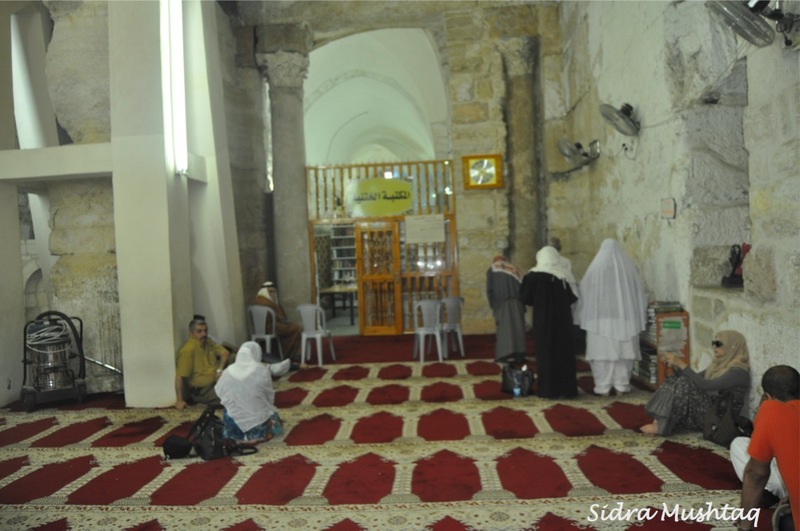 (Women can only pray the fajr prayer in congregation in Masjid al-Aqsa due to limited space. For all their other prayers, they make their way to the Dome of the Rock Masjid). After praying Isha in congregation inside the Dome of the Rock Masjid, Sheba and I went and sat inside Masjid al-Aqsa. Since it was a special night, both Masajids were remaining open until 11pm. The Masjid was full and there were no strict segregation barriers. Women generally were praying and sitting at the back, but it was perfectly fine for them to explore other parts of the Masjid if they just wanted to have a look. After a while, we went and sat in the courtyard, a large area between Masjid al-Aqsa and the Dome of the Rock Masjid. To our right was the breathtaking Dome of the Rock Masjid in full sight; its beauty reminded me of the Prophet’s ﷺ Masjid in Madinah. To our left, we could see the majestic Masjid al-Aqsa, which reminded me of the Ka’aba. It was a beautiful spot to sit. My heart felt at peace; I had so much to talk to Allah about, so many loved ones to pray for. I was trying to capture and behold everything around me, and the above Hadith was being repeated in my mind. This is the Holy Land, the place where hundreds of Messengers came with Allah’s message.This is the Holy Land, a place where angels have descended with Allah’s message. This is the Holy Land, the only place in this world where all the Messengers of Allah prayed at the same time led by the Prophet Muhammad ﷺ. And it wasn’t just any night, it was the actual night of the Miraj, where the Prophet ﷺ ascended to the highest heavens, and then all the way up to the Lote Tree, the farthest boundary and met his Lord. What an incredible night to be there where the beginning of that event took place. How could my mind not be blown away? It was too much to take it all in. Glory be to Him! Allah could have chosen any other time of the year for us to go, but He facilitated our trip to coincide with the blessed event of Isra wal Miraj. That certainly was a great honour and gift from Him, something which I felt completely undeserving of, but Allah gives without measure, even to those who are not worthy because He is Ar-Rahman (the Most Merciful) and Al-Kareem (The Most Generous). This trip became a reality only because of His Mercy and Generosity. Allah truly plans beautifully. There was only an hour left before everything was going to be locked up for the night, only opening again for fajr prayers. Sheba and I decided to spend that last hour inside the Dome of the Rock. The Masjid was more crowded than Masjid al-Aqsa. We went and performed 2 rakat nafl (optional/voluntary prayer) underneath the actual rock which the Prophet ﷺ stood and ascended to the heavens. 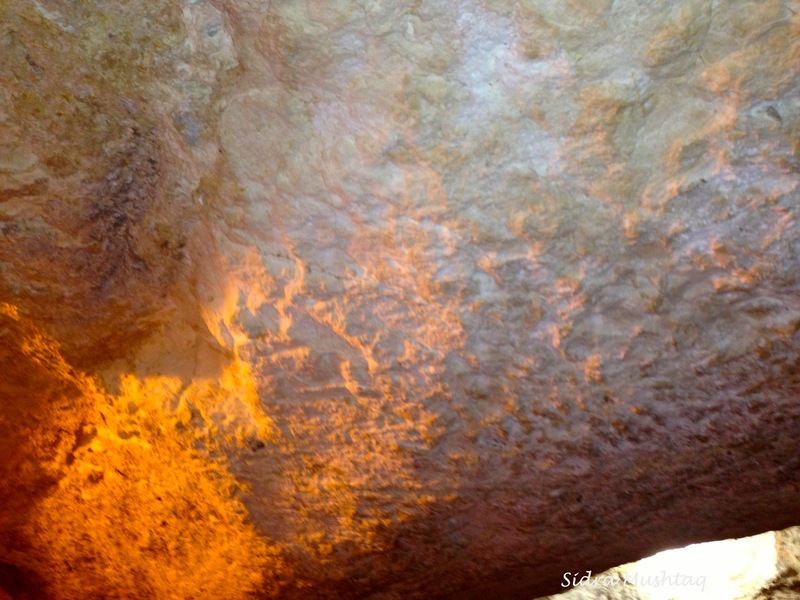 The actual rock which the Prophet ﷺ stood and then ascended to the heavens. On foot and on the backs of laden camels. And the most sublime blessing for the one desiring benefit. Just as the full moon travels across the pitch-black sky. A station never before attained or even hoped for. The precedence of a master over those who serve him. You traversed the Seven Heavens with them. And you were the standard bearer- leading their procession. Nor any higher station for the one seeking elevation. Since you were proclaimed in the highest terms- the unique one. And obtain a secret concealed from all creation. And you passed alone through every station, far from all others. Beyond comprehension the blessings bestowed upon you. Henceforward we became the noblest of peoples. 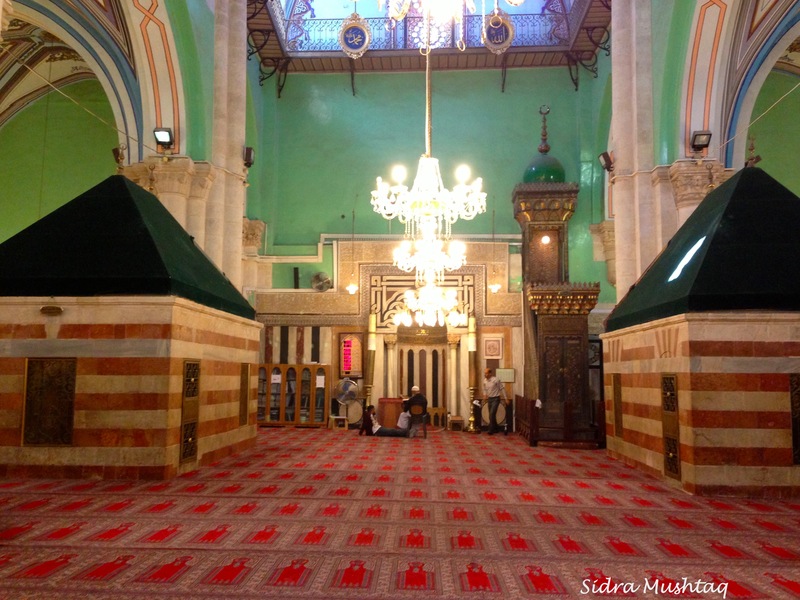 The hour went by quickly, and soon the Masjid was empty; only Sheba and I were left. If there was one place I would not have minded being locked up for the night, it would have been there. We stayed there as long as we could, and probably got an extra 10 minutes before the guards came over to us and alas, told us we had to leave so they could lock up. As much as we wanted to spend the night sitting in the Haram, it was impossible to do so, mainly due to the restrictions and we just wanted to be safe. Alhumdulilah, for every second we were able to spend there that night. After praying fajir in congregation at Masjid al-Aqsa, our group met Shaykh Yusuf Abu Sneina, one of the Imams of Masjid al-Aqsa. 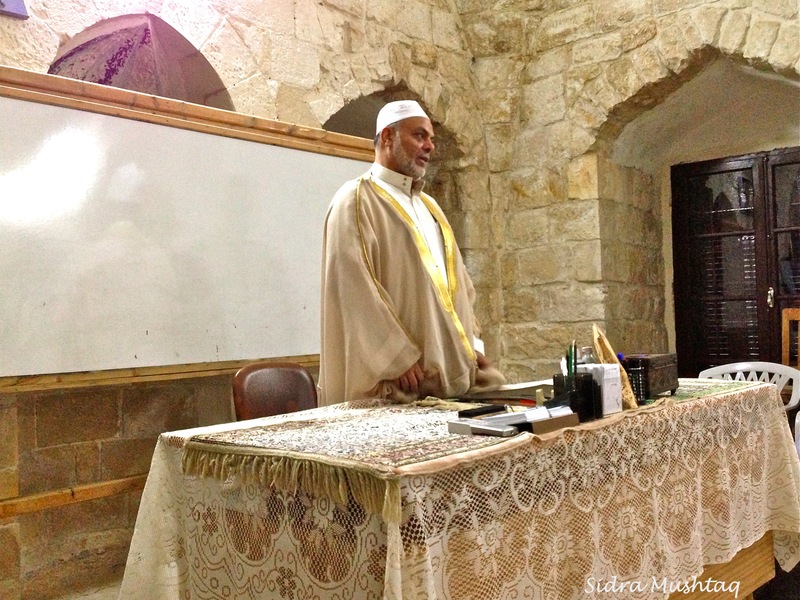 Shaykh Sneina very kindly gave us some of his time and took us for a historical tour around the Haram. I had only slept for a few hours over the past few days, so the sleep deprivation was really catching up with me (bad timing or what?!). I was struggling to function and just stay awake, but somehow I managed. After our tour, we went back to the hotel to pack and check out. I managed to fit in a quick 20-minute power-nap (it was the best thing ever! ), and then drank as much coffee as I could to wake myself up. We only had a few more hours left in the Holy Land, I was not going to waste a single minute. 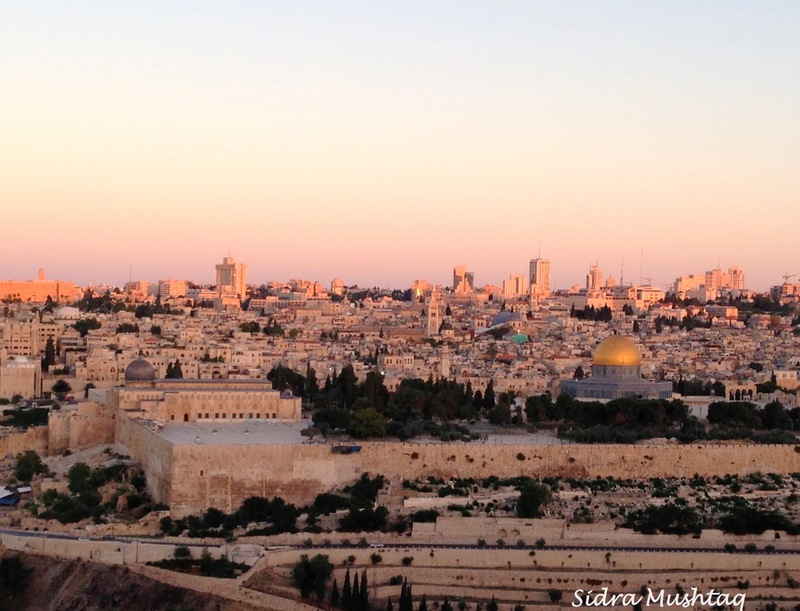 Sunrise over Jerusalem. View from our hotel, top of Mount of Olives. We got back to the Haram at around 11:00am. Jummah was going to start at 12:30pm. This was the only time we actually got to really walk around and explore the place. 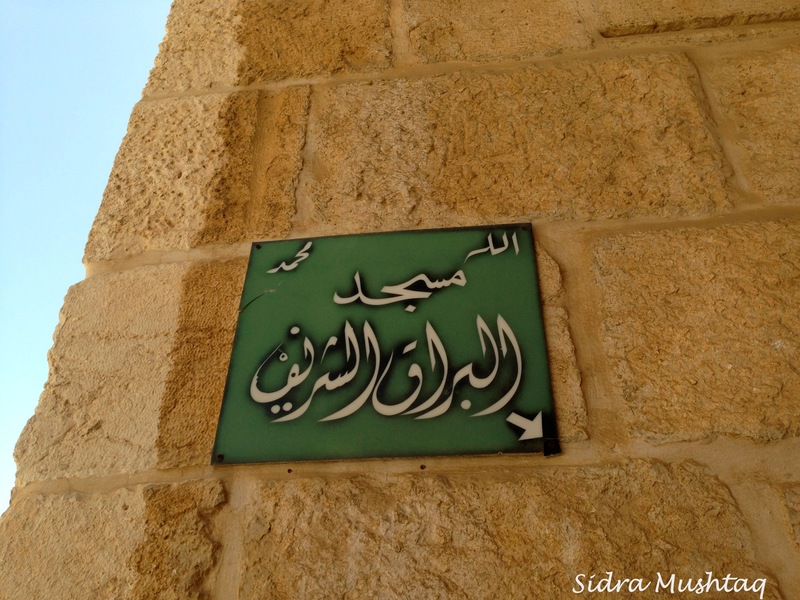 We headed to what was the original Masjid al-Aqsa, which is in the basement of what the Masjid is at the moment. Masjid al-Aqsa in its full glory. Original part of Masjid al-Aqsa. View of Masjid al-Aqsa from the Jewish quarter. Detail. 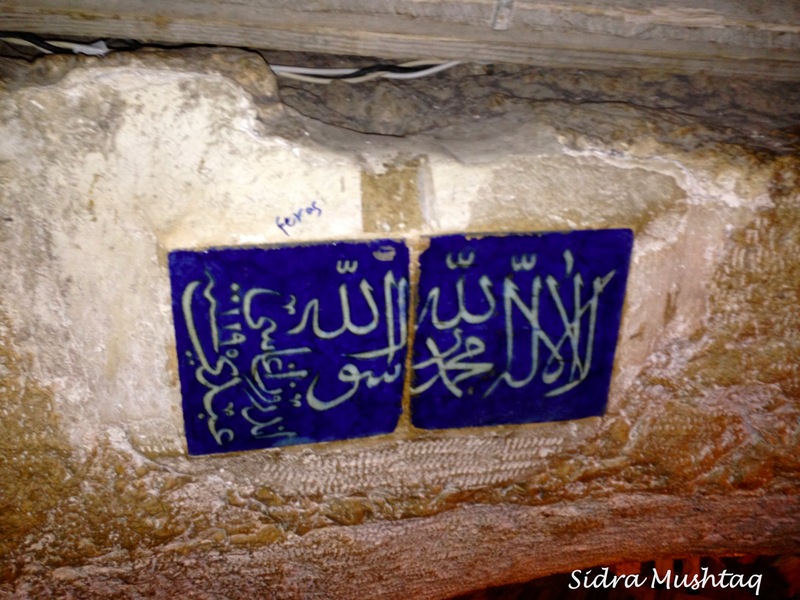 Surah Yasin inscribed around the Dome of the Rock Masjid. 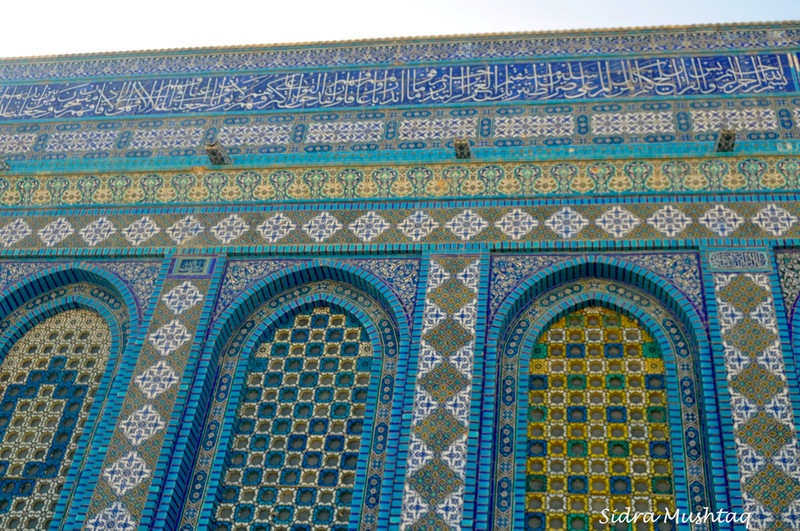 The time of Jummah was approaching, so Sheba and I went to the Dome of the Rock. It was overcrowded, very hot and humid, but the sweetness of where we were made it all bearable. Sheba and I separated, as it was difficult to find a spot to sit together. I ended up sitting next to a bunch of local Palestinian women. 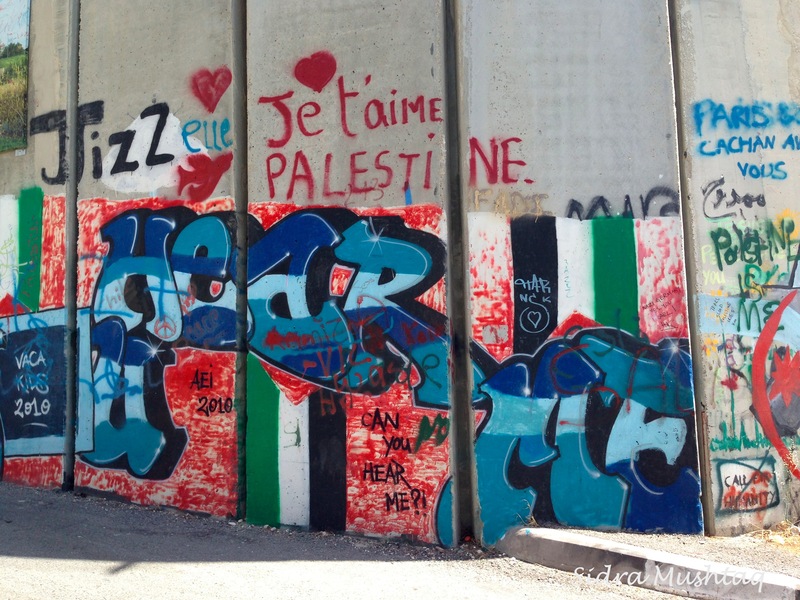 Although my Arabic (which is very limited anyway) is appalling, and the Palestinian ladies could not speak English, we somehow managed to converse and understand each other. I always remember what one of my best friend’s mother, who is Turkish (and can’t speak English) said to me when I met her for the first time in Germany many years ago. She said to me that Muslims communicate with each other through their eyes; so a Muslim will always understand what the other Muslim is saying, or trying to say. I believe this is true as I was able to communicate with these lovely Palestinian women through a mixture of sign and body language, and broken Arabic! After Jummah prayers, we had to find our group, as it was almost time to depart and leave the Holy Land. But before we found our group, we sneaked in a quick visit to a place we hadn’t seen: Masjid al-Buraq. 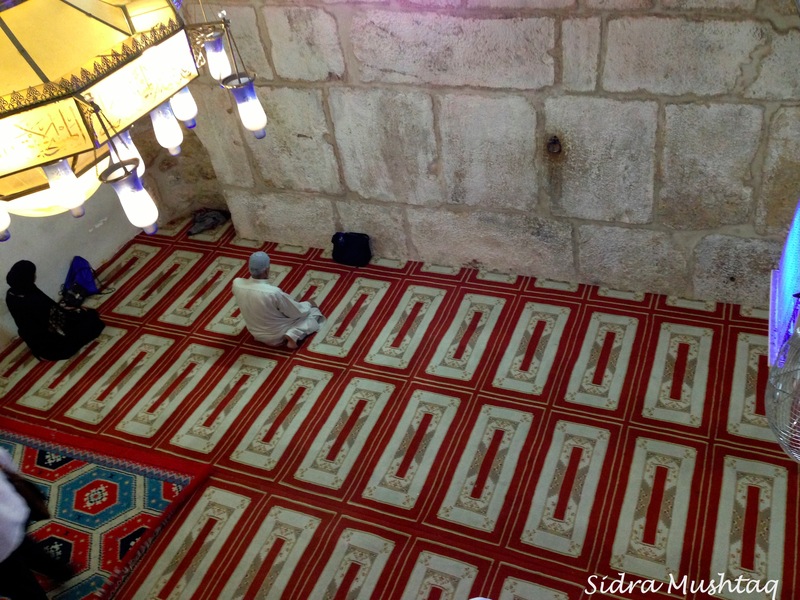 This is where the Prophet ﷺ tied the Buraq, which transported him to the Dome of the Rock and ascended to the heavens. We had to be quick as we didn’t want our group to be waiting for us. We managed to find our group on time, and see Shaykh Sneina once more who came out to bid us farewell. 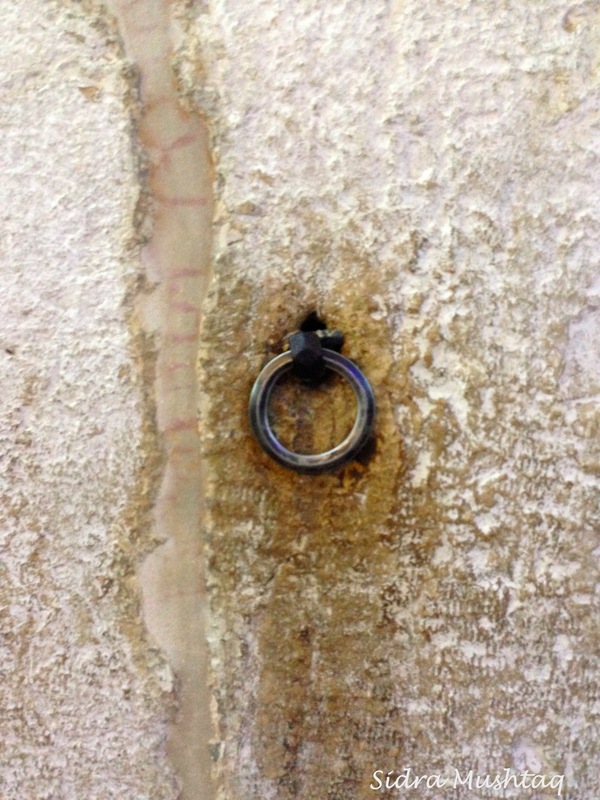 The ring to which the Prophet ﷺ tied al-Buraq. There is a difference of opinion whether this was the actual ring or not. Allah knows best. And then, sadly, the time came when we had to get on the coach and leave. My heart felt really heavy, it’s always difficult leaving such places. I wished we had more time to spend in the Holy Land, but was grateful to Allah for giving me the opportunity of visiting and making this trip possible, even if it was just for two days. 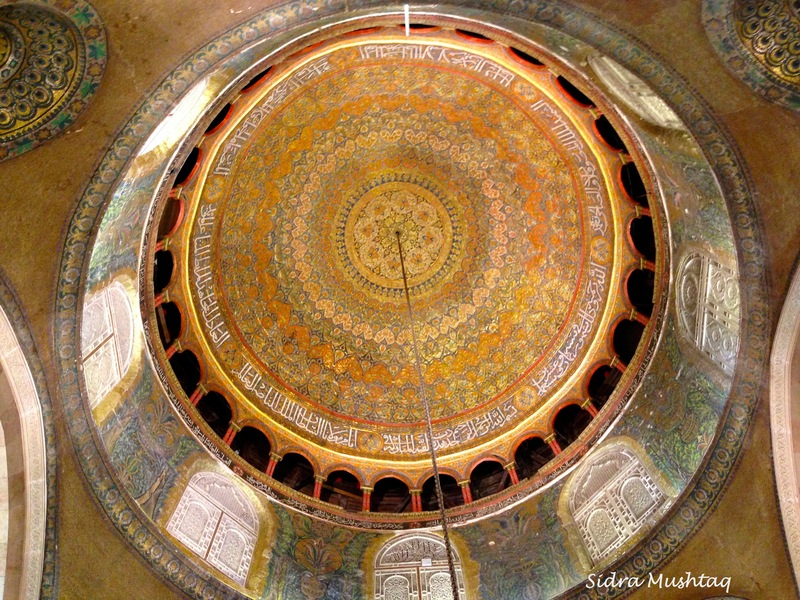 The Dome of the Rock Masjid in its full glory. 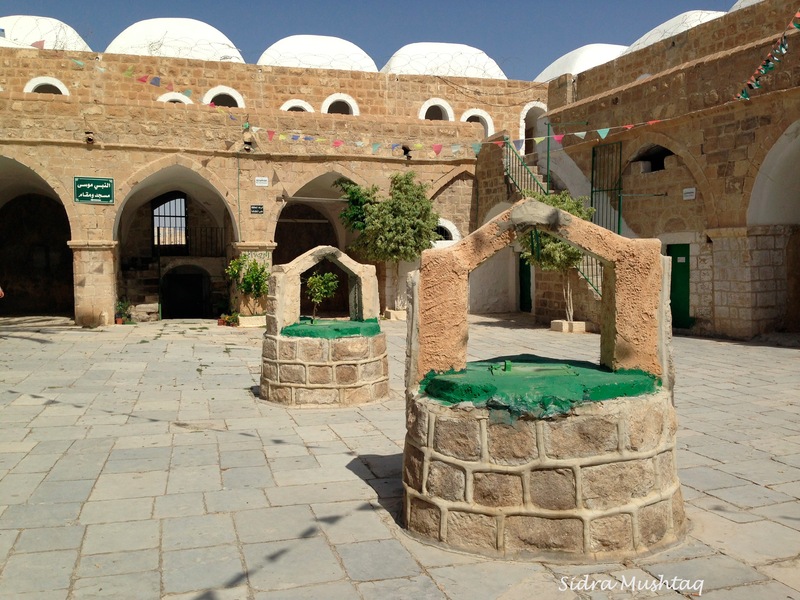 Our last stop out of Palestine was Prophet Musa’s (peace be upon him) Maqam in Jerico. 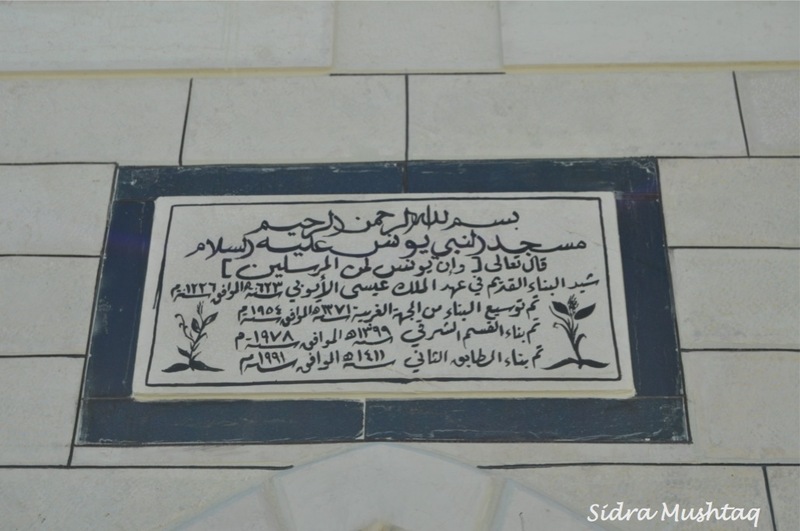 The Maqam is located 11km south of Jericho and 20km east of Jerusalem. Sadly, we only had 10 minutes to spend at the Maqam, just enough time to recite Fatiha and make a short du’a. Courtyard inside the Maqam of Prophet Musa (peace be upon him). If you are planning a trip to Jerusalem and need some advice, please do not hesitate to contact me. Just drop me a message in the comments section and leave your e-mail address. If you are a bit of an Instagrammer like me, then I would recommend following this profile: ZALAMEH, who shares live photos from Palestine and highlights what the current situation is like out there.